“I made it mom,” says Sara Montero to her dead mother while standing on her grave. Sara Montero is a graduate from University, she studied law in other to fulfil her promise she made to her deceased mom. The story of this girl was shared on social networks and took little time to go viral. Becoming a university graduate without support and motivation of parents are another burden itself. Parents motivation and discipline are just some of the things that young university students need to be able to finish their studies. However, not everyone has the opportunity to be able to count on them, like the case Sara Montero. Although there is this difficulty, parent’s words and teachings will always be marked in the hearts of your children. This was demonstrated by Sara Montero, a girl who shared a photograph on her Facebook profile that shocked thousands of users by the words. Sara Montero was so excited to have fulfilled her promised. 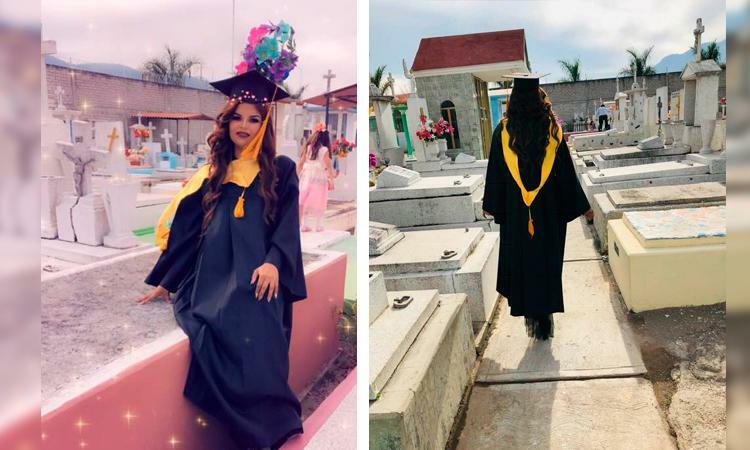 On her graduation day, she took her time to visit cemetery to share her testimony with her dead mother, and inform her: “I made it mom”, that she has become a graduate. She wrote: Here I am MOM, just as I promised you that day that I saw you for the last time, “GRADUATE OF LICENSED IN LAW” you remember? That day I saw you in that brown coffin I thought about dying, I ran out of strength, because losing a mother is the strongest pain you can feel, but you know? I had two beautiful people for whom you fight two offshoots that you left to me, MY SISTERS for that reason, I promised to continue and to make you want more than ever, after Dany (my sister) dies and it hurt me like never before, it was there when I started to study in “UNIVER” my house of studies, and I promised never to give up because I wanted to become an excellent lawyer and look at me here I am, today is my graduation. 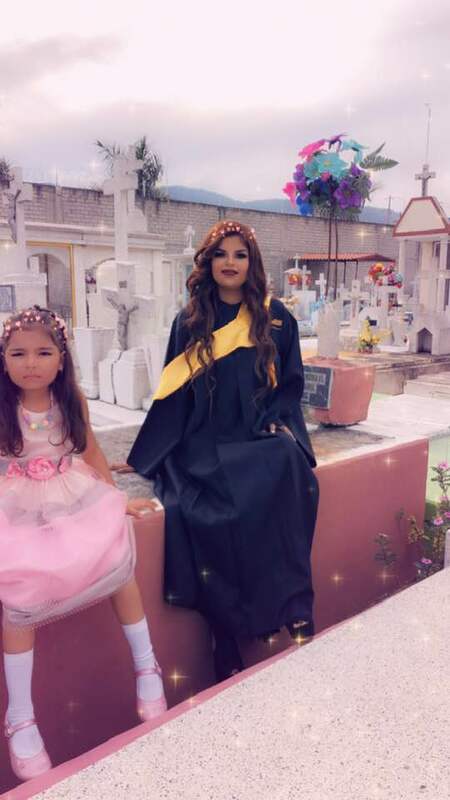 In the image, the girl appears dressed in her graduation gown while sitting on her mother’s grave. After the went viral and shared by many peoples, Sara began to receive messages of support, so she decided to share her story. One of her sisters was sick with leukaemia and her mother tried to pay for the treatment. For this reason, he stopped paying rent one year. The owner of the house arrived one day and took everyone out, without giving them an opportunity to get their things out. At that time, they went to live with their grandparents; When Sara was ten years old her mother got married again, she stayed with her relatives and her mother went with her husband. 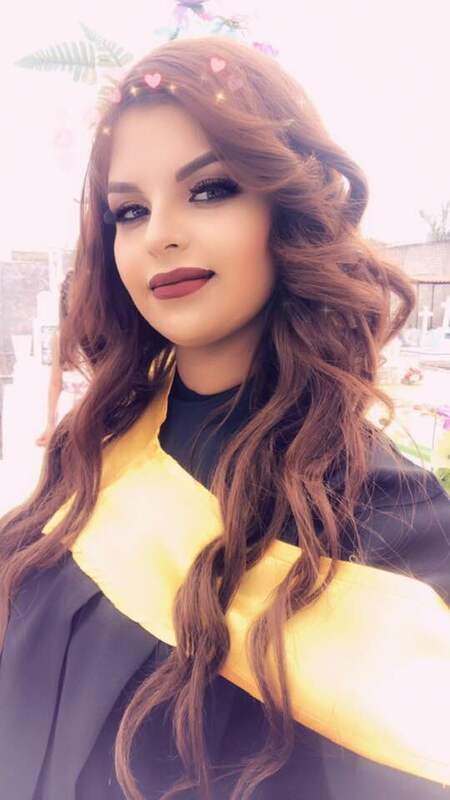 When she saw her mother in the coffin, Sara made the promise that she would be an attorney because everything that happened had been an injustice and would not allow another person to pass the same thing they did.